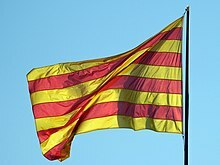 Els Segadors (Eastern Catalan: [əls səɣəˈðos]; "The Reapers") is the official national anthem of Catalonia, nationality and autonomous community of Spain. Contemporary Catalan composer Jordi Savall made a version of the folk song, using the original narrative (which dates back to the seventeenth century) combined with the modern lyrics and refrain, which were added later. The song has also been recorded and interpreted by major artists, included on albums such as Traditional Catalan Songs (Victoria de los Ángeles). In October 2017, American band A Sound of Thunder released a heavy metal variation of the anthem, using a mix of English and Catalan lyrics. ^ the Segadors Revolt which the song references took place in June. ^ The verb in the Catalan original—seguem—is from the same root as segadors; that is, they will cut the chains as they cut the crops. This page was last edited on 14 February 2019, at 01:21 (UTC).